Tonight is our penultimate performance of La Cenerentola, and we’re sad to see the hilarious characters of this Rossini opera leave us. One of those characters is the pompous Don Magnifico, cruel stepfather to Cinderella, who is sung by both Patrick Carfizzi and Valerian Ruminski. We’ve already chatted with Patrick—and you can see him perform in tomorrow night’s closing performance—but now we get to know Valerian, who sings tonight. We talked to this bass about his work on stage, as well as behind the curtain: he runs his opera company in his hometown of Buffalo, NY. Read on for more, and visit http://www.seattleopera.org/Cinderella to grab tickets for our final performances! Welcome back! It’s been a while since we’ve last seen you, hasn’t it? Yes, about six years. I was here in 2006 for Così fan tutte, which was a Jonathan Miller production. That made it very special because Jonathan Miller is one of the all-around great directors and people on the planet. And being in a show with him directing is more like a Broadway theater acting experience, which is always a plus because it’s not your standard “park-and-bark” type of opera singing. Not all directors do that, of course, but Miller is a step above as far as taking us out of the opera element. And you do some directing yourself, don’t you? Only three years of Amahl and the Night Visitors. But I’ve produced eight productions for my company, Nickel City Opera, in Buffalo, NY. Valerian Ruminski as Don Magnifico in Seattle Opera's current production of La Cenerentola. Yes, tell us more about your company! When did you begin Nickel City Opera? Our first production was in 2009. I incorporated years before that, but I was only raising money to raise money, and not getting a production off the ground. But our relationship with the theater changed when they changed management. It’s a non-union, 1100-seat theater, and they wanted to some local company productions happening there, and they asked me if I’d like to start. So we did The Barber of Seville there in 2009, so we’re coming up on our fifth year in a row of doing one large opera every June. We’re doing Don Pasquale next June, and contemplating a fourth year of Amahl, which we do every Thanksgiving weekend. We also did Il tabarro on a destroyer—U.S.S. The Sullivans—in the harbor, with full audience, costumes, lighting. It was at dusk and we had an orchestra on the stern of the boat and staged it all on the back of the boat, with supertitles on a boat behind it. We had about 400 or 500 people in the audience there, next to the Naval Park building. This was part of Buffalo’s effort to revitalize the waterfront, and I tried to get funding for it but I couldn’t, so I relied on box office. We took a hit on the box office, but we got a good review in the newspaper and a lot of kudos for trying. What inspired you to begin an opera company? Well, we haven’t had a company in Buffalo since 1997, and I wanted to give back to my town. There are a lot of reasons why, but I felt there was a call for it. And there were a lot of bad operas happening, a lot of bad productions with people scrambling around, and I knew I could put on stuff that was high caliber if I could find the resources. And I’ve slowly put together the pieces of the puzzle. We’ll see how long I can continue doing it, because I’m working on my own career as well. 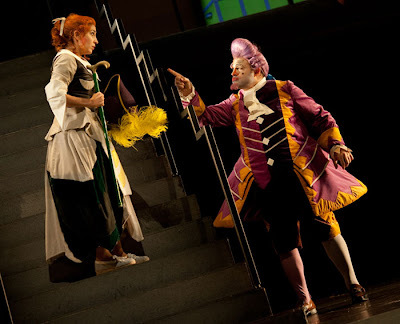 Karin Mushegain (Cinderella) and Valerian Ruminski (Don Magnifico) in La Cenerentola. How much time does it take out of your schedule? Let’s switch over to your career on stage. As a bass, you often have to play the role of the old man; how do you get into the right state of mind for those characters, when you don’t seem to be that old yourself? Well, I’m getting there! I have more arthritis in my hands. Oh, but it’s not that difficult. 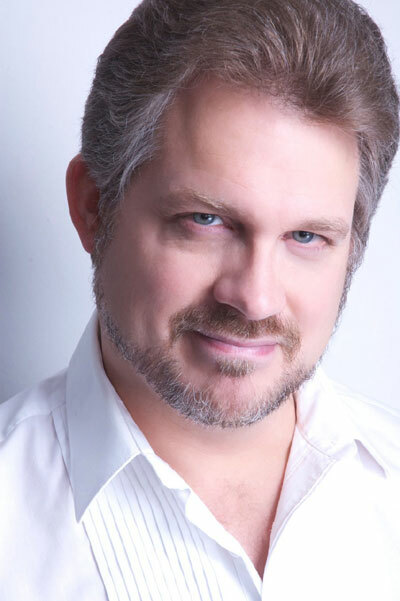 I’ve been trying to act like an older guy ever since I was in my twenties, because I was getting hired to sing Verdi roles where I was supposed to play a character twenty years older. Now I’m at an age where I don’t have to act very much because I’m already in the middle age group, so I can sing these roles and I’m not trying to put anything on. This character of Don Magnifico is older than I am, so I’m playing him a little stodgier, a little more arthritic, I guess you’d say. [Laughs] But it’s not much of a jump to play old men. 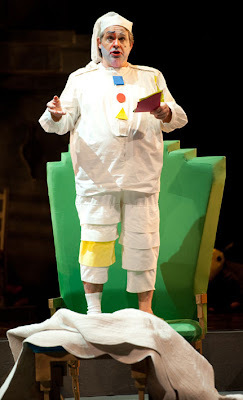 Valerian Ruminski as Don Magnifico in La Cenerentola. What other buffo roles have you done? 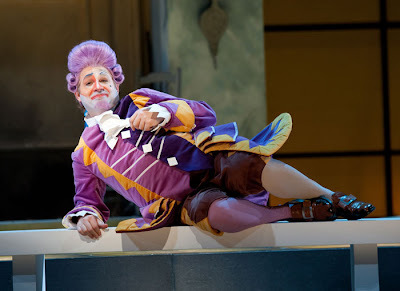 I just did Don Pasquale at Hawaii Opera Theatre this past February, which was a real marathon. And then I did a concert of The Elixir of Love, as Dulcamara. Don Magnifico is my third large buffo role. I’m looking to do more of that. It’s good to make a living doing these roles, but I’m more of a bravura bass than a buffo. The basso cantantes, we’re sort of the chameleons of the bass category. A buffo can’t be a cantante; if you’re a natural buffo, you can’t sing bravura music, you can’t be a leading bass. You have to be a buffo. But if you’re a cantante, you can fake being a buffo. You can make the voice thicker and more bulbous. 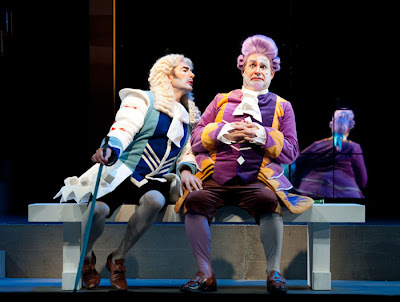 Brett Polegato (Dandini) and Valerian Ruminski (Don Magnifico) in La Cenerentola. Do you have a favorite role in La Cenerentola? Well, it’s my first time, so I’m discovering that. I don’t think I have one yet. But musically I enjoy the drinking scene with the chorusmen. It’s fun to sing and it’s sort of a blustery moment for Don Magnifico. He’s full-blown, and as close to his dream as he’s going to get. It’s stupid—he’s been made captain of the wine cellar, who cares?—but he thinks it’s the greatest thing in the world so he’s lording it over everybody. This is his big moment. From here on, he’s diminished because he finds out his daughters are not going to be married.